Of course a phones priority should be to make calls, but today people expect so much more from these powerful mini computers resting in their pockets and purses. The Android operating system is the most powerful and fastest selling mobile phone operating system available today. Not only does it enable you to make phone calls, but to send text messages and chat with your friends online; browse the web; check your email; purchase and listen to music; take and share pictures and video; manage your contacts, calendar and to-do lists, gps navigation and much more. With Android smartphones using more data monthly than all other smartphones combined, they are truly connecting the masses online wherever they may be. Android definitely does not fall short when it comes to customization however. With a market accessible directly from the phone and growing in applications by thousands every week, it can be difficult for a new user to sift through everything out there and pick the few that really make the phone their own. I have pointed out my top 10 favorite applications with a short description of each to help you as a starting point. Seems like people are doing more playing than talking on their mobile phones these days, but when you do talk there is no better way to do it than with Google Voice. Screen and block unwanted callers, personal greetings for individual contacts or groups, record your conversations, get voicemail transcribed to text with lots of delivery options, a new number to ring all your phones (mobile and landlines), free unlimited text messaging. Full integration with Android makes it simple to use as a full phone and messaging replacement. The Google Voice beta just ended, so it is now open to everyone to try. 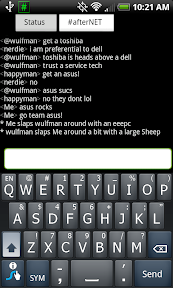 Why type when you can Swype? 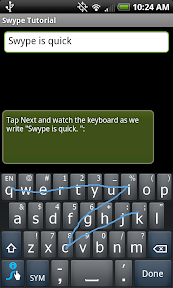 This software keyboard replacement is not only fun, it is the fastest way to enter text on your mobile devices. Full replacement means it is available for use directly in all of your apps, (no copy & paste needed on Android). Run the tutorial after installation to quickly get you up to pace on this awesome input method. I also recommend using MyTextSpeed to really learn how to swype fast. The latest round of beta just ended, but hopefully they will do another soon or release the final product shortly. This home screen replacement is the best i've seen. It takes the standard Android desktop and makes it faster while adding some new features and customization. Includes up to 7 home screens, expose effect, a scrollable dock bar with customizable apps and icons, 3d app drawer, landscape mode and more. 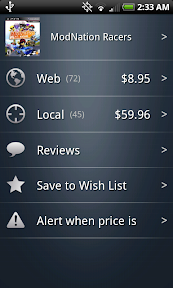 The only negative is losing the Sense Widgets, but there are many widget packs available in the market to replace them. Updates are frequent and it just gets better as they get closer to a final release. 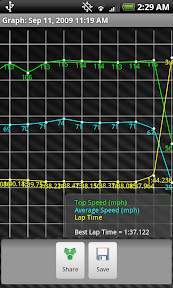 Trackmaster is a very precise lap timer, but that just barely scratches the surface of this apps features. It is also a great data logger and gives you very useful statistics. If you participate in any type of motor sports, you will not know how you ever did it without Trackmaster. Take it with you to your club racing, lapping or hpde days, rallycross, autocross, etc. While it's not something everyone will use, it is simply an amazing app and really showcases what is possible on Android. For drag racers and tuners, check out Dynomaster by the same author. This is a full featured SSH and telnet client which supports public key authentication and port forwarding. Works with hardware or software keyboards and maps essential keys like ctrl, alt & esc. I use this to remotely and securely manage my servers, home DVR and connect Andchat (below) to my IRC proxy (which is only possible using true multi-tasking only available on Android). Not an essential app for everyone, but no SSH application on any other mobile platform can compare to Connectbot when you really need it. 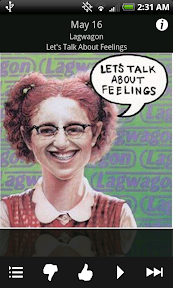 Pandora really needs no introduction. You can use it without any account or registration, but if you are willing to part with $3/mo you get some good premium options including no ads and high quality audio. Pandora for Android is great and the desktop widget and stations folder make it a better experience than other mobile platforms. You can get Widget Locker from the market and use the Pandora widget on your lock screen for a truly immersive experience. I have invested a lot of time writing algorithms to create the perfect playlist and while Pandora does a good job for casual listening, when I really want to rock out I will play my music directly from my SD card using the built-in Android music player. Since my algorithms depend heavily on Last.fm data it is only right to give it back. 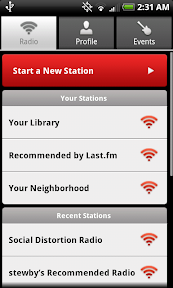 The official Last.fm application is the most full featured and also works with ScrobbleDroid and Simple Last.fm Scrobbler API's so it is the only scrobbler you need. On Android, Last.fm can scrobble music played from any application immediately and directly from the phone, no syncing with your PC required. Most of my online social interaction happens on IRC instead of Facebook or Twitter. It is one of the first real-time chat protocols and one of the last places online where you can find any sort of privacy these days. It is a great place to go if you need some Linux or programming help (just don't be surprised if someone tells you to RTFM if you haven't done a simple Google search first). You can find me on AfterNET. First winner of the Android Developers Challenge, ShopSavvy is a great tool that can save you some time and more importantly some money. Simply scan a barcode or search by product name and it will find the cheapest prices for item online and local. You can even set up shopping lists (or wish lists) and price alerts to be notified when a product falls below a certain price. Unfortunately it is no longer an Android exclusive. I am a rally fan and the recently released official WRC application for Android is perfect. It gives complete access to the latest rankings and news, event information, driver and team bios, stats, photos, and even videos from the events. It's everything a rally fan could ask for besides a seat next to Loeb as he dominates the competition in Bulgaria next week. Facebook: An essential app to most, however the featured Android phones these days usally come with Facebook support built right in with much better integration than the offical application. Twitter: Same as Facebook, most phones come with better support built-in and the official app requires Android 2.0 or higher. Twidroid is a good Twitter client, but I have a strict policy about giving my sensitive login information to 3rd parties. Spare Parts: Some developers don't know how to write applications for mobile devices and can eat through your battery pretty quickly. This is a great utility to see what applications are using up your battery as well as tweaking some phone options for longer battery life, but if you stick to well known programs from good developers shouldn't needed. If you find your battery isn't performing well download it and look for applications with high partial wake lock usage. Astro File Manager: A good utility for managing phone storage, all of which can be accomplished using the built-in operating system tools or by connecting your phone to a computer via USB. It is good to keep around but will not be needed daily. Techbuzz: A nice RSS reader and widget, however it lacks the ability to add your own feeds and I much prefer the news app included with Sense UI. Newsrob is supposed to be a good reader also, but requires your Google account login and password which makes it a deal killer for me. Shazam: Pretty cool program that uses the phones mic to identify music playing. If the list was the top 15 applications, it would be included for sure. ShootMe: Takes screenshots (like the ones here), but unless you are using an HTC Evo, it requires the device to be rooted. Weatherbug: Good weather application with current conditions and forecast, a good widget also, but it eats through your battery like crazy and I have no problems with the default Sense UI weather app. Fring: Video chat. Supposed to be good but is currently broken on the Evo and suffers horrible video lag. I hope this list helps you get started using and customizing your new Android phone, or can introduce long time users to new applications. If you have a favorite I missed, please leave it in the comments below. see that some of your favorite apps on my list as well. Good list of apps! All are the best apps which you shared with us especially Google Voice because you can easily chat with your friends and family through this app.